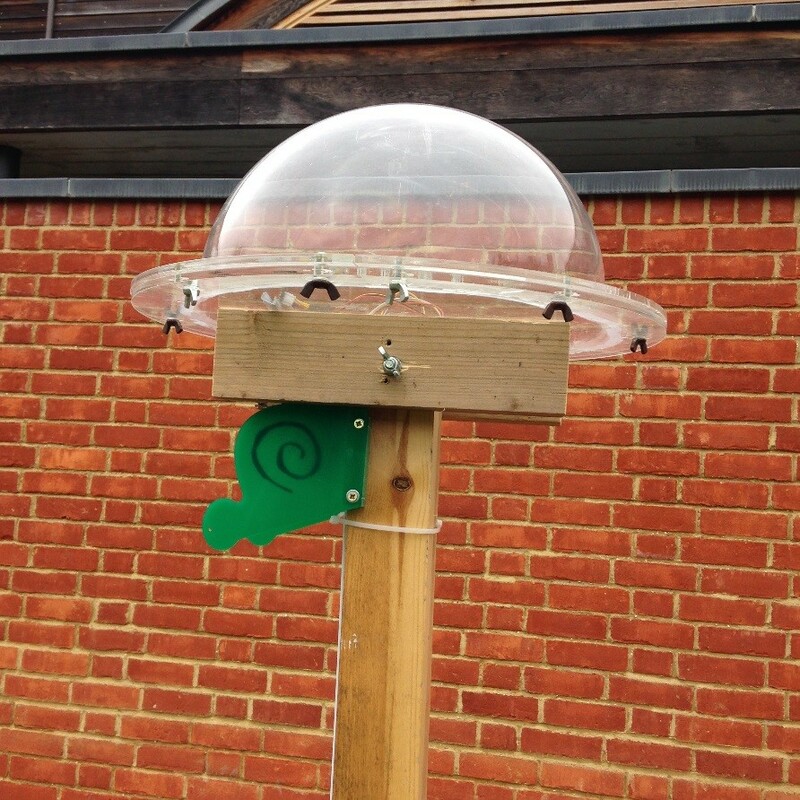 Why is there a flying saucer in The MERL garden? Science engagement officer, Robyn Hopcroft, reveals one of our new growing projects and the feat of DIY ingenuity behind an unusual landmark in our garden. If you’ve visited us in the last couple of weeks, you might have noticed that something funny is going on with our garden. Perched above one of the raised beds there’s a suspicious object. Something that bears an uncanny resemblance to a spaceship. Well let me put your mind at ease. I can explain. It’s all part of a new growing project and that spaceship is here to help. 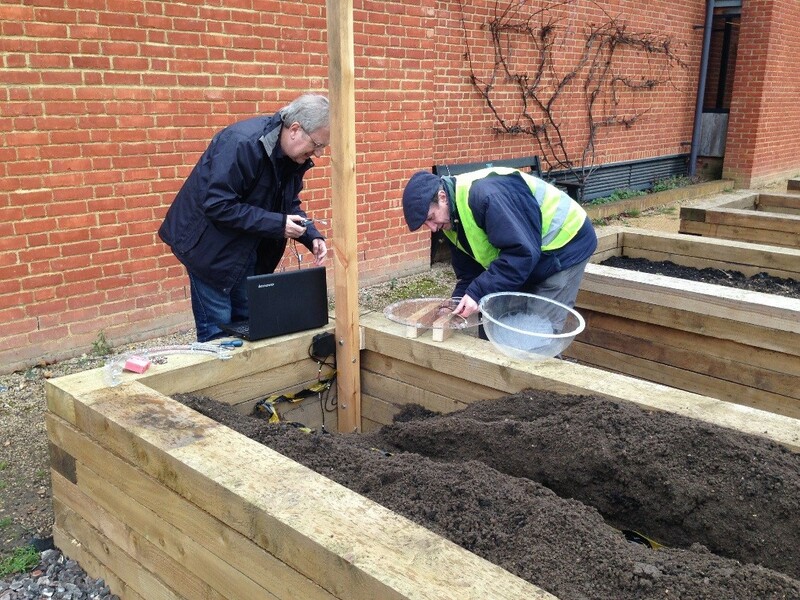 Alongside our new community growing spaces, we have built a raised garden box with a focus on science and technology. 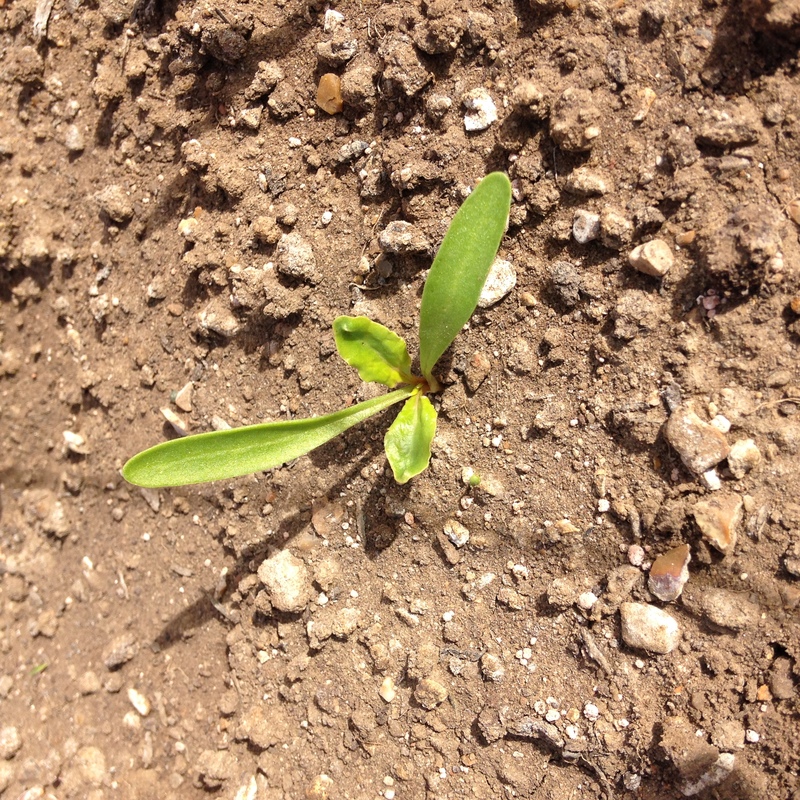 Our inaugural project will see us attempt to grow sugar beet. Being museum folk, we love a terrible pun, so I feel no shame whatsoever in revealing that our project is rather dubiously titled ‘Beet Box’. Who knew this is where much of our sugar comes from? Image by Okt154 [CC BY-SA 4.0]. Is the world ready for Beet Box? We think so. 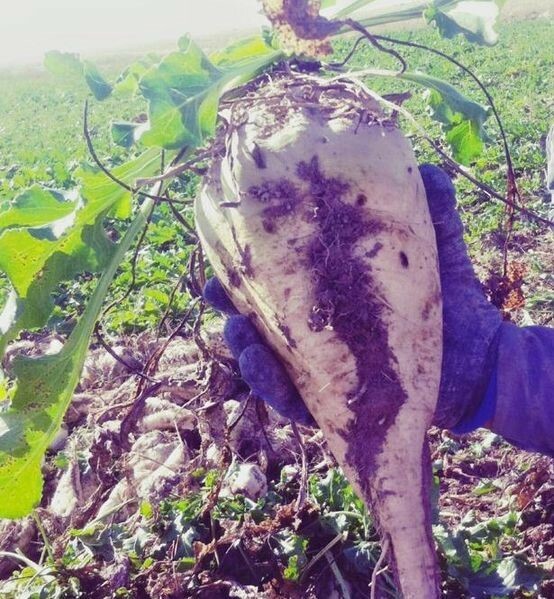 Around 7.5 tonnes of sugar beet is grown in Britain each year and these crops are used to manufacture a large proportion of the sugar that we consume. With this in mind, we’re keen to learn more about the history and practicalities of this industry. 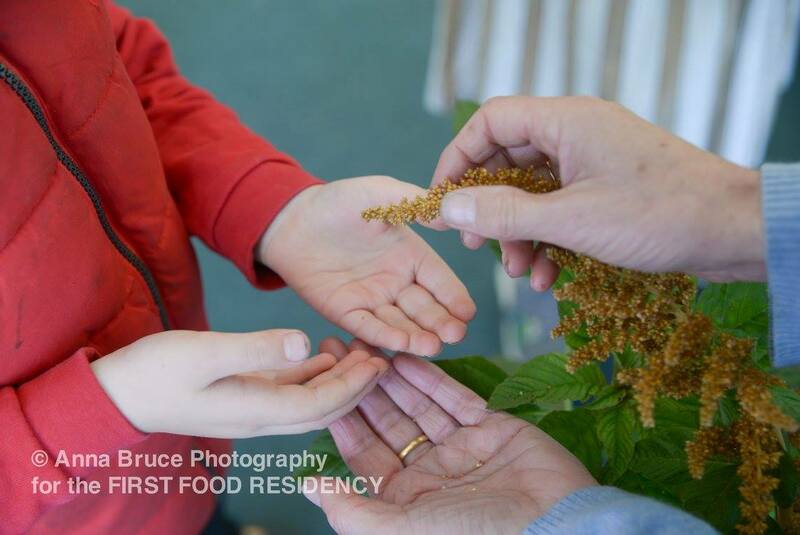 We might only produce a few kilos of beets and a very small amount of sugar, but this provides a good opportunity to explore the process of sugar production from first-hand experience. 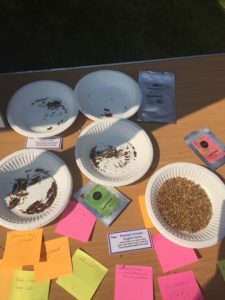 It seemed fitting that we sow our seeds on British Science Week, and using expert growing advice and seeds provided by British Sugar gives us the best chances of success. Let’s cross our fingers that conditions will be right to take our tiny crop to harvest. 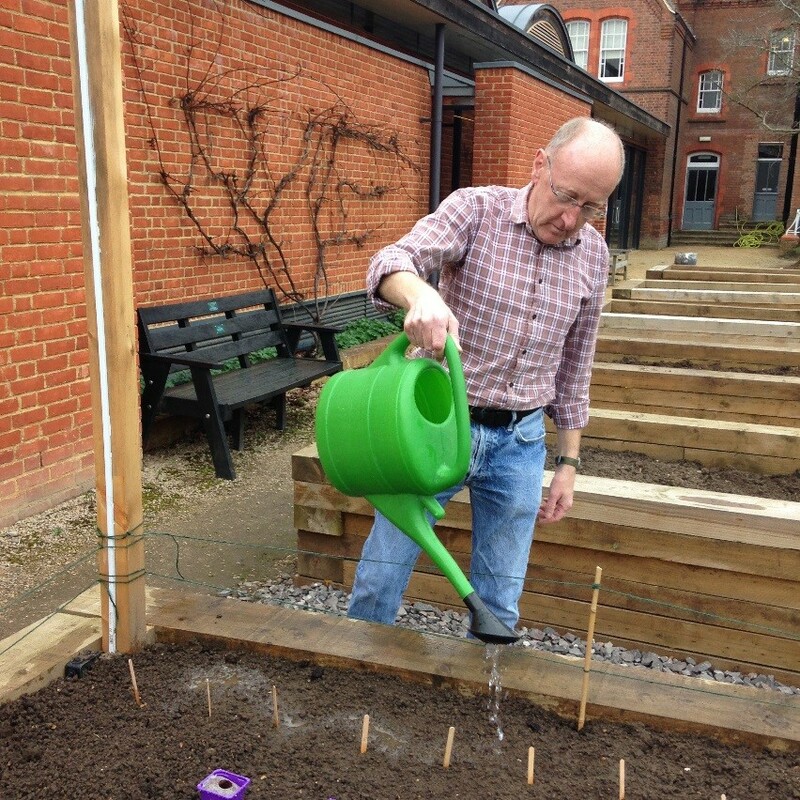 Science engagement volunteer, Don, watering in our newly planted beet seeds. So where does the spaceship come in? We wanted to do more than just grow beets, we also wanted to explore how technology could be used to track growing conditions. We’re delighted to be collaborating with Reading Hackspace on the project, and several their members have kindly donated their time and expertise to design and set up a monitoring system for Beet Box. 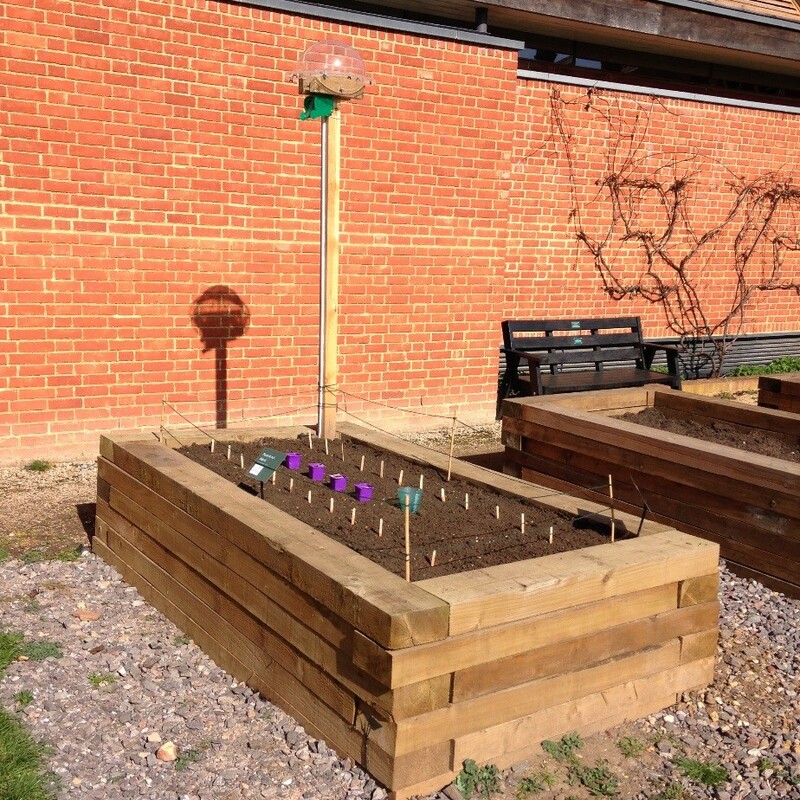 Having installed soil and weather sensors, they also plan to use a solar-powered camera to capture information about the growth of the beets, and the solar panel is intended to sit inside that nifty Perspex spaceship enclosure. started installing monitoring equipment in the Beet Box. 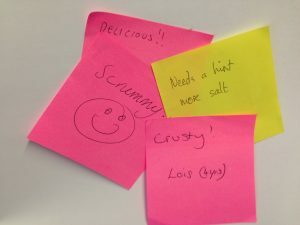 The Hackspace folks are a community of enthusiastic makers who use rLab – a peer led workshop, open to anyone who is interested – as a base for knowledge sharing and work on a wide range of fascinating projects. The team working on Beet Box have taken care to design a system for the garden box that is open source and uses widely available components, providing an opportunity to use the project for educational purposes and to allow anyone to replicate or take inspiration from the setup. In the weeks and months to come, we will share more detailed information about the system and the progress of our beets, and get feeds up and running so that data from the project is freely available online. In the meantime, we anxiously await the germination of our beet seeds. 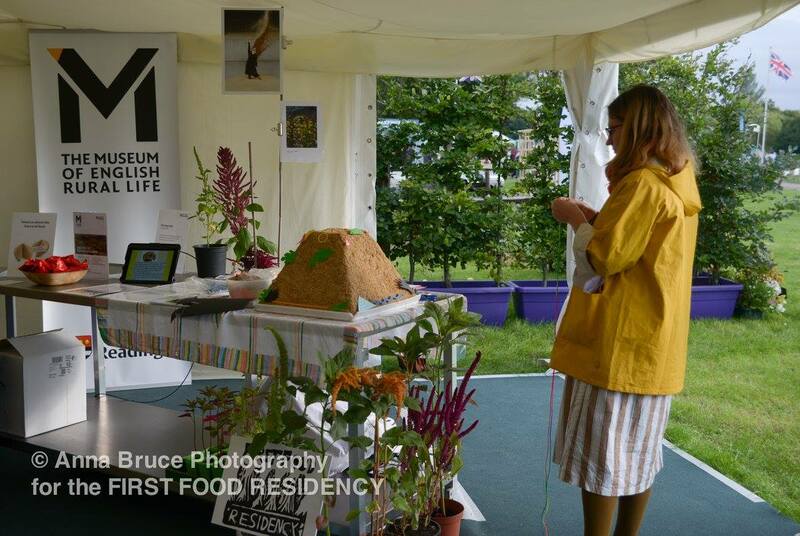 Science engagement volunteer, Eilish Menzies, considers beekeeping and the role that it plays in food production. Walking through the MERL galleries you can see the crucial role bees play in past and present global food security. By simply taking a stroll through the collection, you can really get a sense of the progressive steps that honey production has made and inspired throughout agriculture. Our library, archives and Special Collections also contain multiple historical books on bee keeping, bee anatomy and honey cookbooks. However, for a process so old and ingrained in societies all over the world, it seems strange that we are now facing an international reduction in bee colonies. Much like humans, bees are social creatures, meaning they live together in large colonies. They present one of the few examples of true eusociality, where all individuals in the hive work by cooperative division of labour. The hive is essentially controlled by one female, known as the queen, whose sole function is to reproduce. As the name would suggest, honey bees produce honey. This is their primary source of food and it is obtained from the nectar of plants. Bees on the whole are incredibly important players in the ecosystem ballgame. When foraging for food they act as pollinators for a range of different plant and tree species, and contribute £200 million to crop production every year in the UK. It’s estimated that one in every three mouthful of food we eat is dependent on pollination by bees. 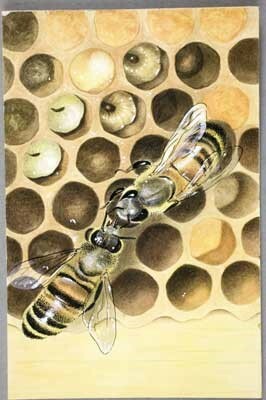 Illustration from Life of the Honey Bee. Our relationship with bees stems back millions of years, when ancient human cultures would collect honey from wild bee colonies. However, this wasn’t for the faint hearted, as it almost always involved climbing to high and hard to reach places and sticking your hand in a nest of unwelcoming bees. It wasn’t long until humans began to domesticate bees by providing artificial spaces to house the hive. 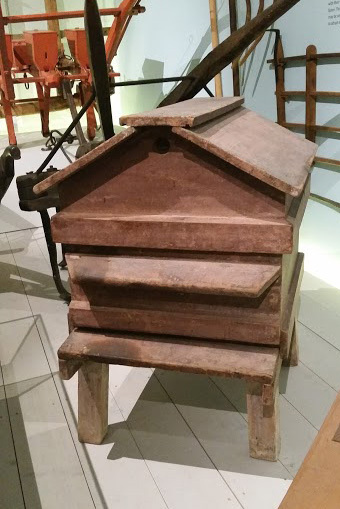 As the growth of bee keeping continued to spread, many new structures were produced to improve the collection of honey. The typical hives you see today are known as Langstroth Hives, named after Lorenzo Langstroth. His design has remained relatively unchanged for over 160 years. A Langstroth Hive from our A Year on the Farm gallery. As for the future of bee keeping, things seem a little bit uncertain. National statistics show that bee populations have not been able to keep up with the increased demand for honey. Disease and harsh winters have meant the global production of honey has become much more irregular, leading to an increase in price. As pollinators, bees are responsible for large proportions of global agriculture, meaning a decrease in their population could have severe consequences on food production and ultimately our survival. This issue becomes apparent when you consider the role of bees within the pollination of rural crops around the globe. Smallholder agriculture makes up 80% of the crops in Africa and Asia and is particularly important in developing communities. For the 2.5 billion people living off of these crops, optimising pollination could be the primary approach in food security schemes. 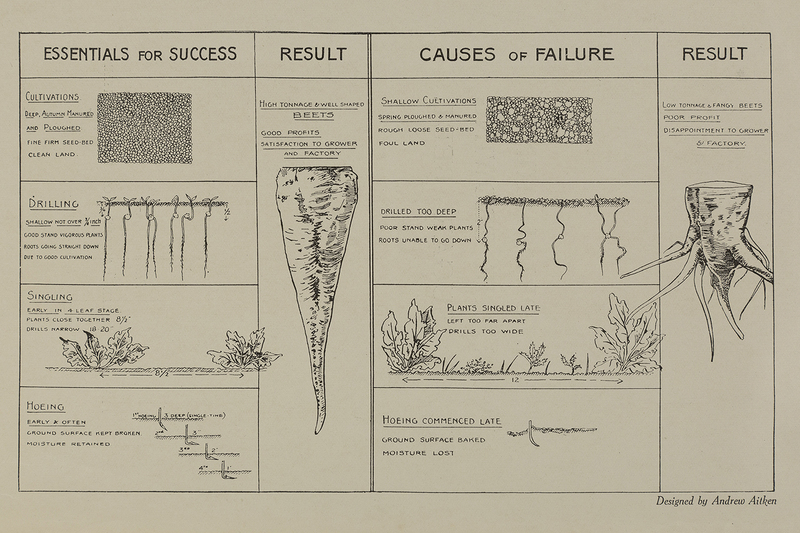 As the MERL galleries demonstrate, change and uncertainty has always plagued our agricultural industry. We can only hope that the bee populations and the honey industry continue to adapt to these changes and that our future collections will be filled with the results of these achievements. Is farming crickets and making flour an energy efficient and environmentally friendly process? Crickets emit 80 times less CO2 and require significantly less water than cattle rearing. Farming Crickets takes 95% less land space than rearing cattle on farmland that is shrinking every day. We hope to one day use solar power to heat our warehouse to reduce our environmental impact even further. Has it been difficult to get started? Are the regulations for this burgeoning industry easy to navigate? The process to get started can be lengthy due to the natural breeding and raising process of crickets and there are also health & safety guidelines and practices that need to be put in place like any other food manufacturer. There are a many online documents that make the regulation side a lot easier to navigate and get your head around. Are there any incentives to get involved in edible insect farming? There is currently no government support that we are aware of however we have had support from our local growth hub in Northampton. We are potentially looking at launching a KickStarter campaign to raise some extra funds to get our products out to the UK market quicker so everyone can enjoy the benefits of eating cricket-based products. Who are your target clientele? We have no set clientele and hope that our products will appeal to all those who are initially a little bit curious and adventurous but also willing to try an alternative, healthy protein source that comes with many other health benefits as well. We think there could be high interest within the sports and fitness market segment as their openness to new products with high protein content is high. Our products are gluten, soy and dairy free so we hope to be able to target a wide audience. People who love baking and want to make goodies that are a little healthier will also love our products. We use cricket flour to make tasty brownies. How are you going to convince people that cricket flour is for them? That is the million dollar question, the western world is not familiar with eating insects at present but we believe the tide is slowly turning. The US and Canada have several farms now and have reported great successes with many happy and healthy cricket-eaters. We believe the same can be done with the UK market and have already had interest from a local gym network as well as catering companies throughout the UK. Market research will of course remain a key tool to continuously work on product placement and branding to encourage uptake. It took a many years to persuade the UK public to try sushi, but when they did the outcome was fantastic and now it is one of the most popular types of food that exists. We believe that one day insect-based foods can do the same! We aim to market our products both online and in affiliated stores. Our interested clients operate across both platforms. 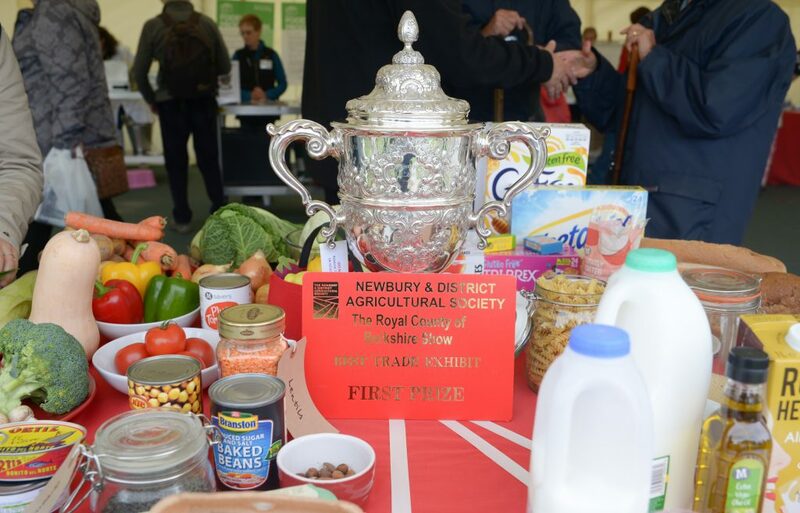 We will also take our products to local and national markets and fairs to help promote awareness and get as many people to taste our products as possible. What’s your favourite thing about cricket farming? We both love that we are helping to develop a new frontier in both nutrition and sustainability of our planet. The health benefits that we have already seen through using cricket products are also something that continues to drive us. Although still in our early stages, we hope to one day be one of the key drivers of this industry as it grows and grows. Another great thing is the beautiful chirping sound they make. It may be pouring with rain outside, but in the warehouse with the warmth it feels like you’re sat on a beach in the Mediterranean… just without the sun, sand and cocktail in hand! I would say there are no big frustrations (at the moment!) but as farmers of living creatures the process of raising crickets can often be timely and therefore a patient mindset is definitely necessary. How would you describe the current state of edible insect farming in the UK? It is very much in its early days. There are a few companies trying to explore and develop this industry in the UK that I know of. I have heard of more starting recently, so hopefully the industry will start to develop more rapidly and more cricket products will be available to the public in the near future. Interest in cricket products is definitely picking up though. We’ve recently had an enquiry from a company that wants to use our crickets in their canapés! Yum! When it comes to edible insects, what is your vision for the future? We believe that there is huge potential for the edible insect industry in the future, not only globally but in the UK as well. Every year there is more and more pressure being placed on traditional livestock and protein sources, and we believe that one day demand will outstrip supply (or they will have to severely reduce the way livestock are kept to increase production, which we don’t want). Insects are highly nutritious, not just in terms on protein but also in other nutrients such as iron, amino acids etc. They require a lot less water to raise, a lot less food, a lot less space and release less harmful gases into the atmosphere. In places like Africa, which still suffer from severe malnutrition, we believe that insects could be one of the ways to solve this problem due to the small quantities of resources needed to raise them and their nutrition values. In places like the UK, which are more developed, we believe people need to be more aware of the environmental impact that our over-consumption of livestock is causing and be open to trying alternative protein sources which in their original form may look unappetising, but used as an ingredient in other forms can be delicious and add an extra health kick to their meals. Changing people’s opinions is always a difficult task, but we believe that once this happens the insects-as-a-food-source industry will flourish. Please do write us a comment if you have any other questions that relate to cricket farming or edible insects and we’ll try and rustle up some answers. The founders of Newtri Foods talk to science engagement officer, Robyn Hopcroft, about cricket farming in Part 1 of a Q&A about their edible insect business. Edible crickets. Image by Tim Olson [ CC BY 2.0]. So at MERL we’ve been thinking about the future of food and investigating edible insects as one possible means of addressing the growing need for sustainable sources of protein. 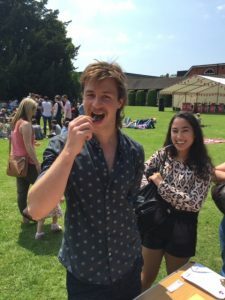 Last month I witnessed many people taking to edible insects with great enthusiasm at the University of Reading Big Band Lunch. 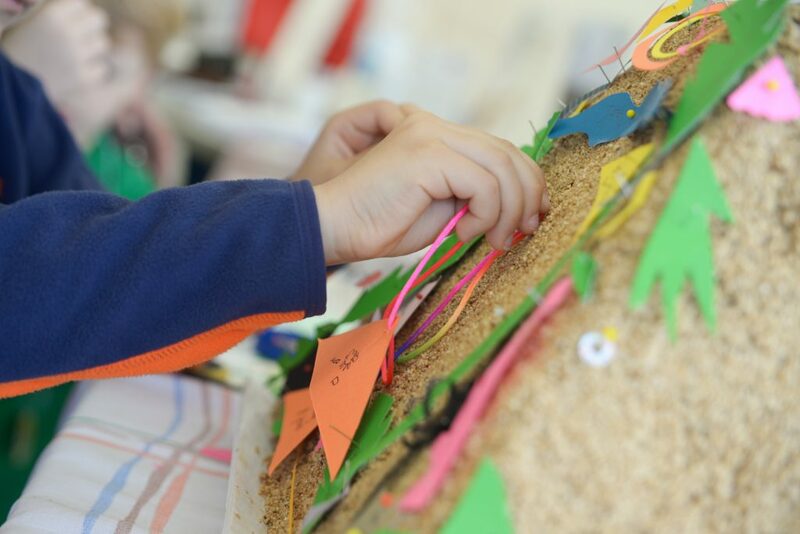 This week, we paid a visit to the Highdown School Science Fair, where game students were lining up try mealworms, cricket flour brownies and giant waterbugs. While watching people chomp on creepy crawlies is quite entertaining, it also made me wonder about the other side of things. I’ve seen people consume plenty of insects, but how are they produced? 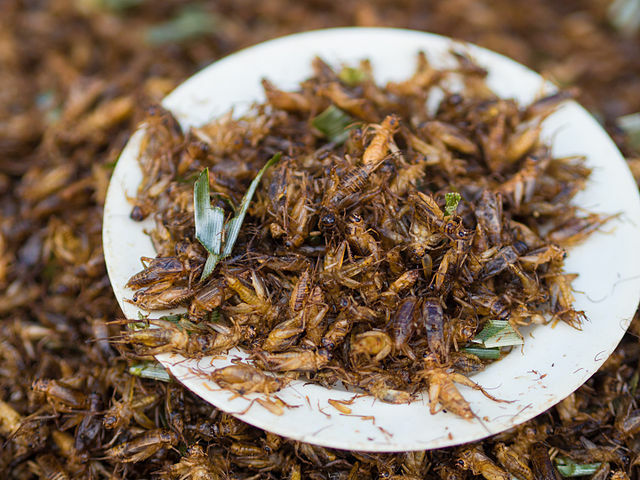 What’s the deal with edible insect farming? Thankfully I managed to track down a couple of friendly cricket farmers based in Northampton, who were happy to answer a bunch of questions posed by the curious staff at MERL. This is the first part of a Q&A with Matt Grant and Matt Hardy – Co-founders of Newtri Foods. Newtri Foods aims to be one of the first companies in the UK dedicated to the farming of crickets and the creation of cricket-based products (flour, protein bars and whole crickets) exclusively for human consumption. How, when and why did you get into edible insect farming? Where did the idea come from? We have both been lucky enough to have travelled extensively. Matt H explored South East Asia for a year whilst Matt G lived and worked in South America for a year. Through these travels we both had the opportunity to try various meals and dishes that incorporated insects. 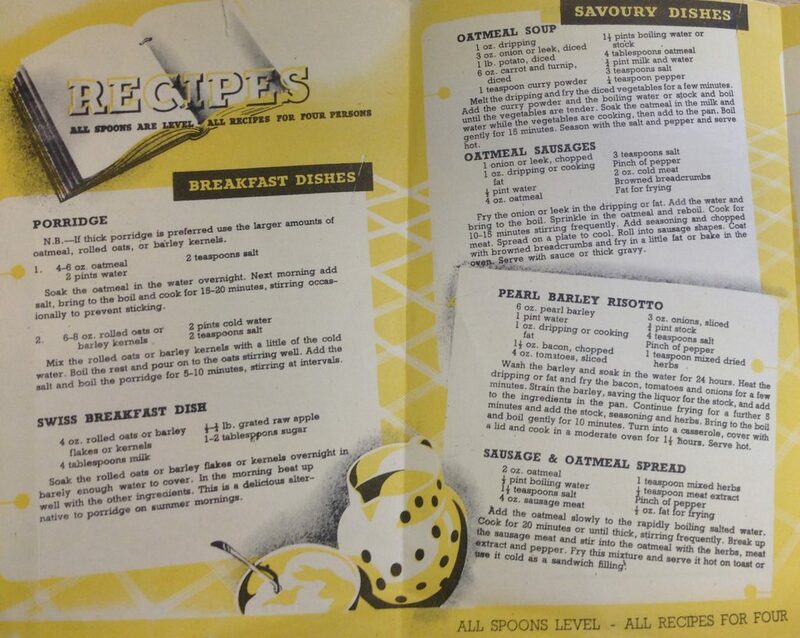 They were all extremely tasty and after a bit of research we soon realised that they were also extremely healthy. This got us thinking as to why very few people in Europe consume insects and if the option was available in various forms whether people would give it a try. Currently many UK companies producing cricket-based products are importing from places like Thailand and Canada. The fuel used to transport them to the UK offsets the environmental benefits of consuming insects so we want to assist this market by providing these companies with locally sourced crickets, reducing their carbon footprint and the impact on the environment as a whole. Are you regular insect eaters, yourselves? We have tried a range of different insect-based products and dishes abroad and often include cricket flour in our daily lunches and dinners. 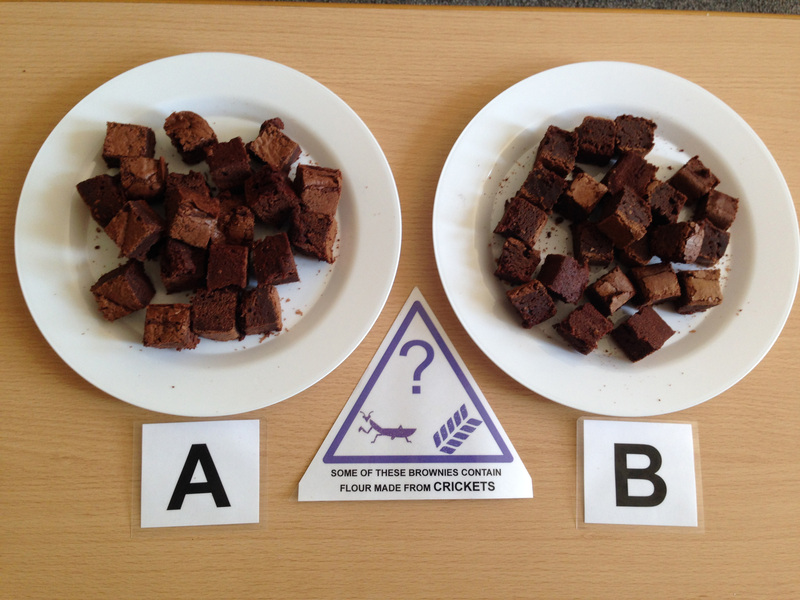 Healthy cricket flour brownies are one of our favourite snacks! Why crickets and not some other kind of insect? We are both enthusiastic about maintaining a fit and healthy lifestyle and the high protein content in crickets was something that attracted us to farming them. Crickets are also one of the insects that are most accepted by the wider population to eat, and they have a mild taste so it seems like a great place to start and get people accustomed to eating insects before other insect types enter the market. What type/s of cricket do you use? Where do they originate from? Are all types of crickets edible? We currently farm the Acheta Domesticus species, and the original batches were sourced from the USA where cricket-consumption is a lot more established. All the breeds we have researched so far can be consumed by humans. Acheta domesticus. Image by Brian Gratwicke [ CC BY 2.0 ]. What are the steps to raising crickets? We raise our crickets in a sterile environment with a minimum temperature of 25-28 degrees Celsius. The warmer the temperature the more active the crickets are, which promotes their breeding activities as well. We have a separate area for incubating the eggs and managing the young crickets before reaching adult size. 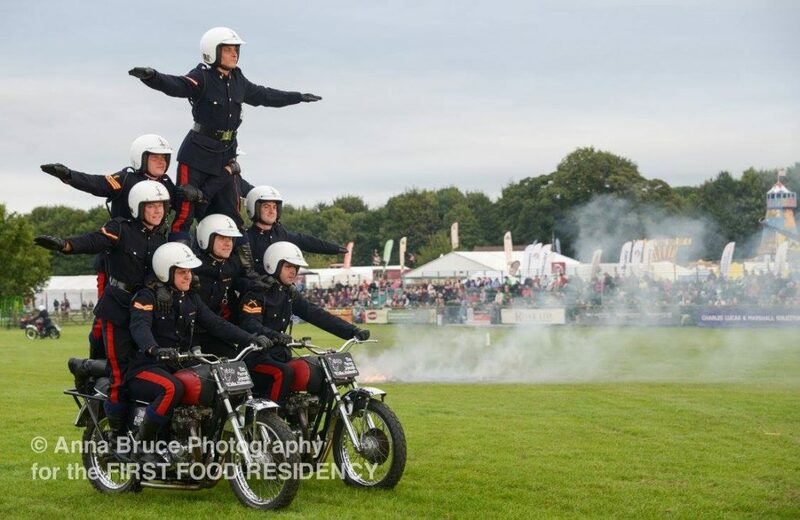 Thankfully none have escaped our units so far, although it can be difficult with the babies! We have toyed with the idea of keeping a resident lizard in the warehouse to catch escapees before they get outside the unit! 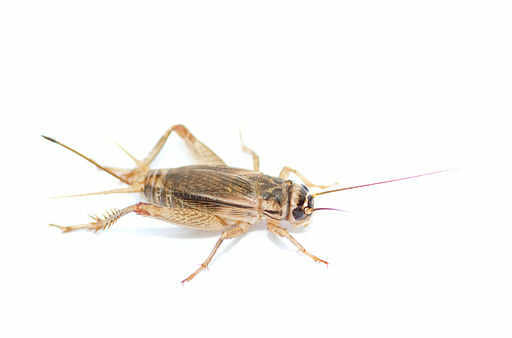 Our crickets are fed on a gluten-free organic feed; this is supplemented by fresh organic vegetables from our allotment. How are crickets harvested? Is it humane? Is there ethical guidance on farming insects for food? Yes, there is ethical guidance on farming insects which is widely available and discussed online on respected forums and organisations’ websites. Crickets are cold-blooded and therefore the most humane way to harvest them is to reduce their body temperature through freezing which humanely and rapidly slows down their metabolism. 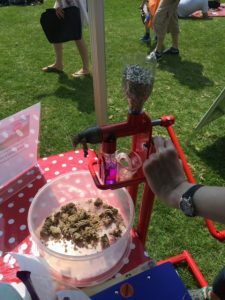 What are the steps to making cricket flour? 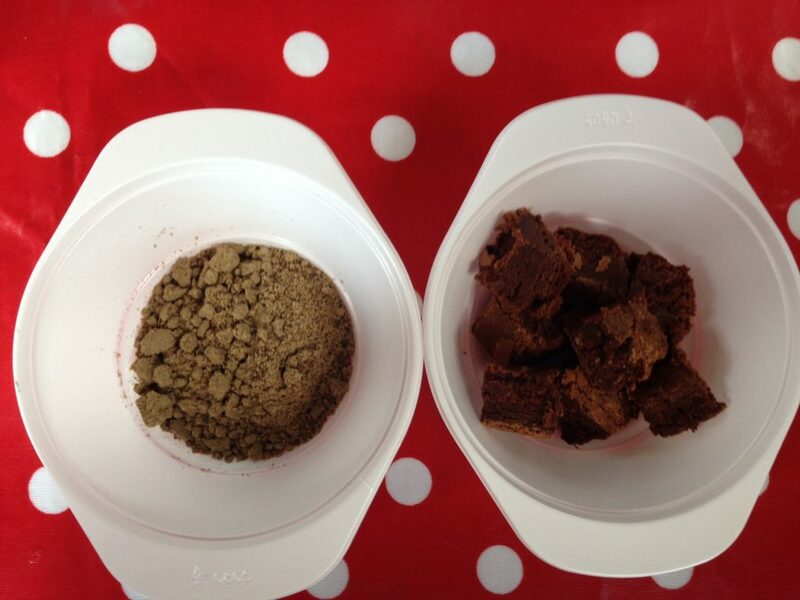 Our crickets go through multiple different stages before being made into cricket flour from freezing to drying. Unfortunately this is a process that we cannot reveal too much about for the moment! Do you use the whole insect to make flour? No, the cricket’s wings and legs are sifted out throughout the process. This isn’t to say that none slip through, however they are just as edible as the rest of the cricket! 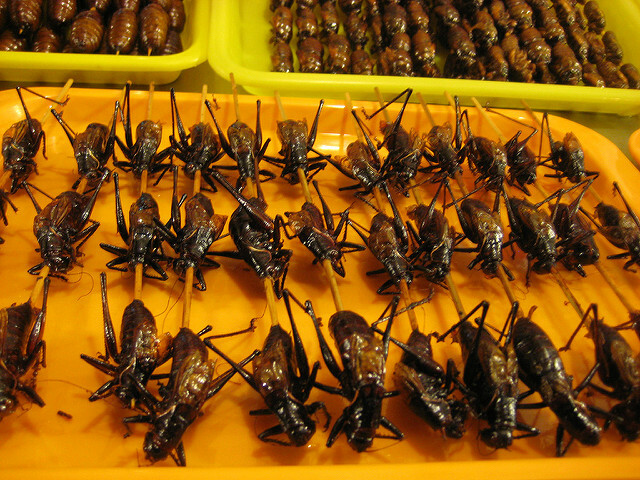 Deep-fried house crickets sold as food at a market in Thailand. 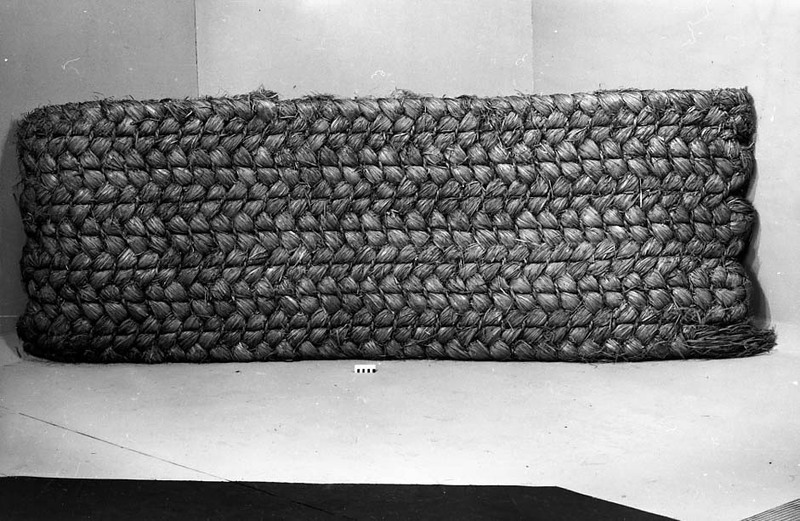 Image by Takeaway [ CC BY-SA 3.0]. Around how many crickets does it take to make a bag of flour? Quite a few and it depends on the size. We’ve found that it roughly takes around 1000 crickets to produce 100-120 grams of flour. How long does it take to get from cricket egg to cricket flour? The cycle is usually six to seven weeks from hatched baby to harvesting time. How easy is cricket flour to use in baking? Is it just for use as a replacement for wheat flour? Cricket flour is not a substitute for wheat flour. Although flour is in its name it is a different ingredient and can be used in protein bars, drinks, smoothies, and baked products to add a significant protein boost and health-kick to whatever you are making. 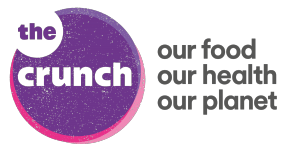 Our new Science Engagement Officer, Robyn Hopcroft, provides an update on the Wellcome Trust funded project: ‘Our Country Lives: Nutrition, Health and Rural England’. The university’s Special Collections Service holds an archive of Ladybird books and artwork, including many beautiful illustrations relating to science and agriculture. 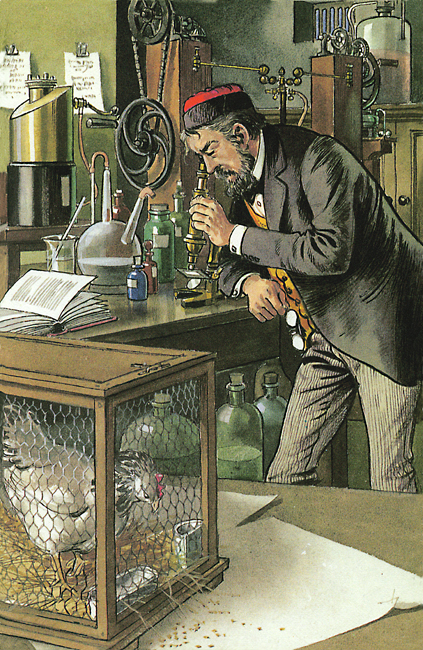 Louis Pasteur in his laboratory from ‘The Story of Medicine’ (Author: Edmund Hunter, Illustrator: Robert Ayton) © Ladybird Books Ltd 1972. Although I’ve only been with MERL for a few weeks, it’s already clear to me that this is the perfect place for delivery of an exciting project centred on these themes. 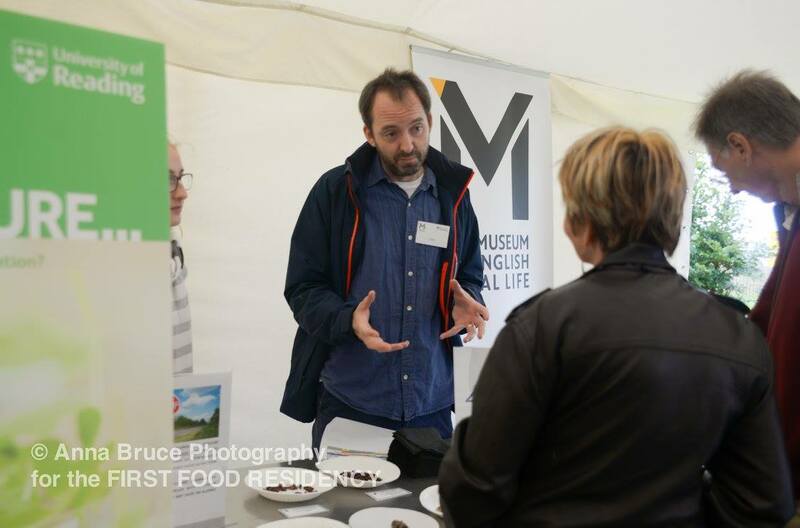 The Museum comprises a driven team who are keen to rise to the challenge and get people thinking about big topics like food security, sustainable agriculture and the essential functions that rural life serves in contemporary society. 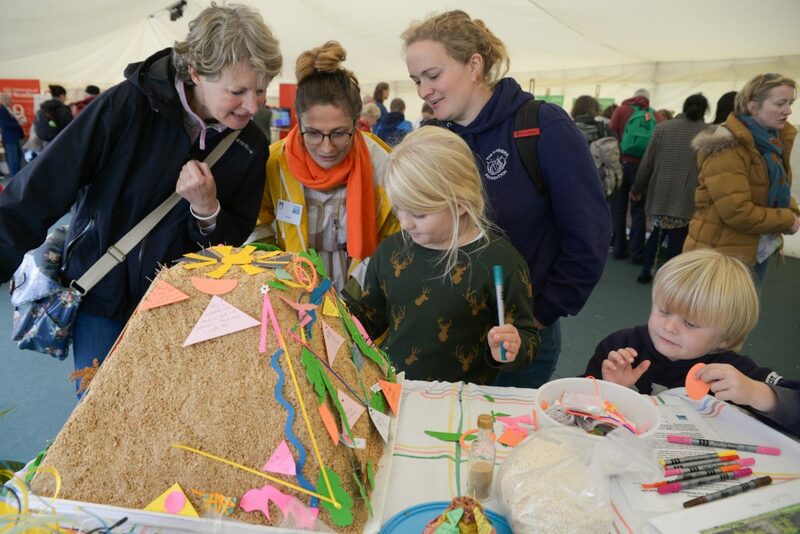 We hold rich collections and stories that can act as conversation starters around these kinds of issues and maintain close connections with the University research community, who offer a glimpse into the future of the countryside by sharing the latest science news. 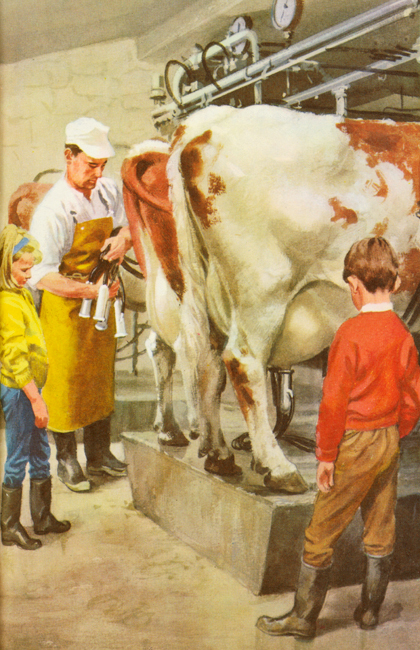 Milking the cows from ‘Fun at the Farm’ (Author: William Murray, Illustrator: Harry Wingfield). © Ladybird Books Ltd 1965. While loads of work has already been done to incorporate scientific themes into the redevelopment of the galleries, we want to go even bigger and better. Now that I’ve started my job as the Museum’s Science Engagement Officer, the project enters a new phase. I’m looking at additional programming to get people thinking and talking about the science behind life in the countryside. 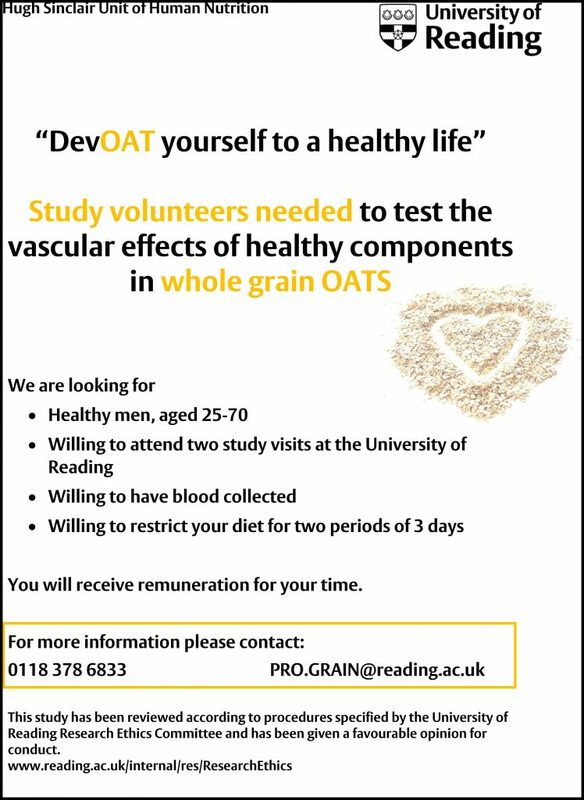 To start with, I’ll be trialling some hands-on activities that relate to food and nutrition. 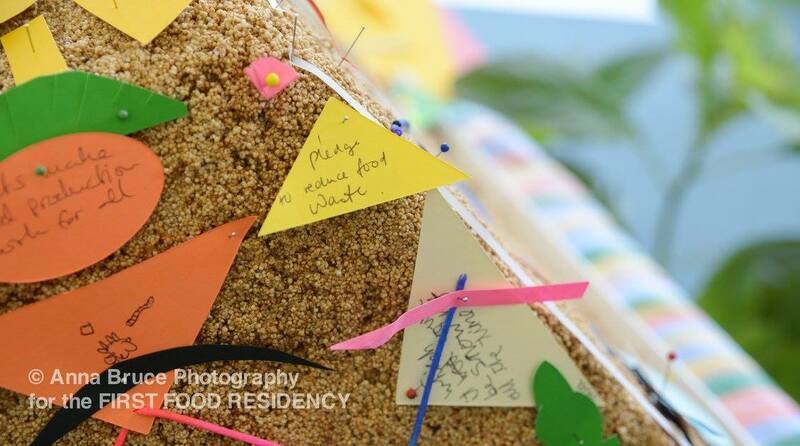 We’re also in the very early stages of planning an artist residency, which will provide a platform for an artistic interpretation of issues relating to livestock management and animal health. As we’re eager to get people talking online, we will be making some short films and injecting some science into our social media accounts. This is a wonderful opportunity to work across disciplines and get stuck into finding interesting ways to connect people, science and our collections. It’s an ambitious project, I’ll admit. But so far so good. Wish us luck! 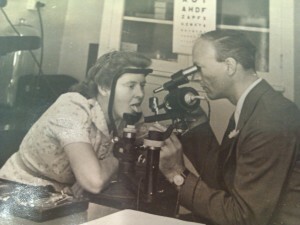 We’ll be keeping you up to date with project developments in a ‘Wellcome news!’ series of posts here on the blog. Wellcome news for Our Country Lives! It has been hard keeping the news under wraps for the last few weeks, but it is very exciting to finally be able to share some news which will have a really significant impact on the Museum’s redevelopment. 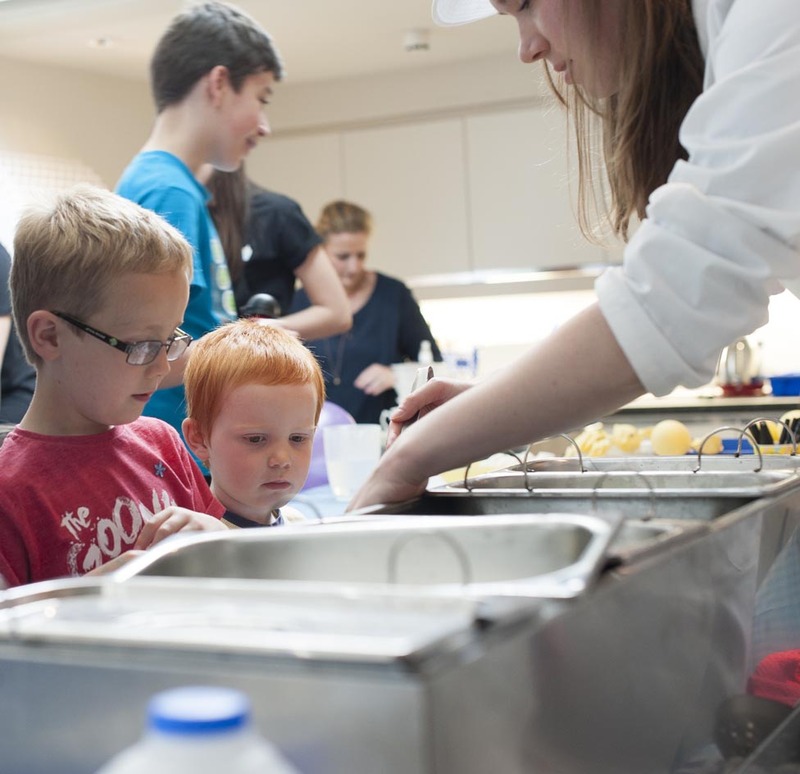 We are delighted to announce that The Wellcome Trust has awarded the Museum £385,277 for a new project, ‘Our Country Lives: Nutrition, Health and Rural England’. 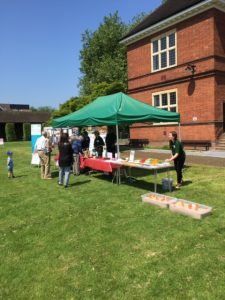 This will support the Museum’s current Heritage Lottery funded redevelopment and introduce new themes and interactive opportunities connected to animal health, human nutrition and rural healthcare. We will be taking on new staff to work on the project, and a panel of specialist advisors will also help deliver a dynamic and diverse programme of science engagement, including online content, hands-on experiences and artistic interventions developed in collaboration with bio-medical experts. For the very first time the Museum will be able to explore the extraordinary links between science and the countryside, connecting these vital topics to its diverse and surprising collections. Emphasis on the science underpinning rural life represents an exciting challenge and a new direction. 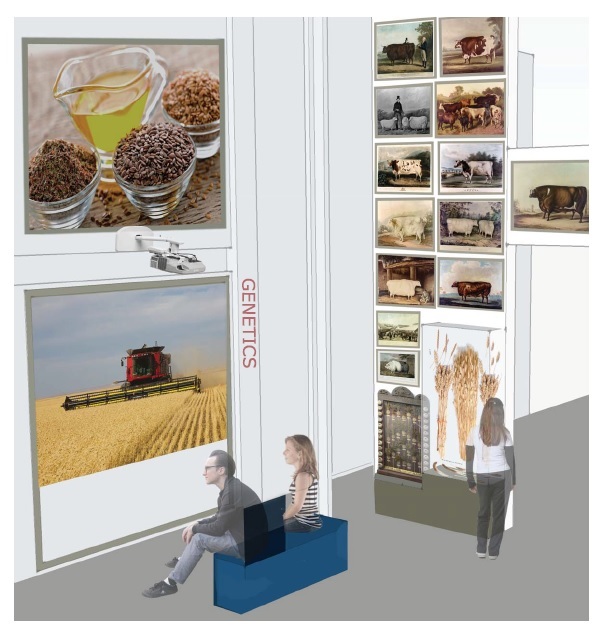 This project will transform the Museum from a site of agricultural heritage into a centre that engages the public in the science behind the food that they eat, the research that underpins the health of domestic animals, and some of the biggest challenges of the 21st century such as food security and human nutrition. Such topics will form the focus of interactive opportunities and exhibits in the new galleries, where visitors will be able to explore subjects as diverse as bovine tuberculosis, the challenges of animal birthing and the latest research into links between milk fat and health. 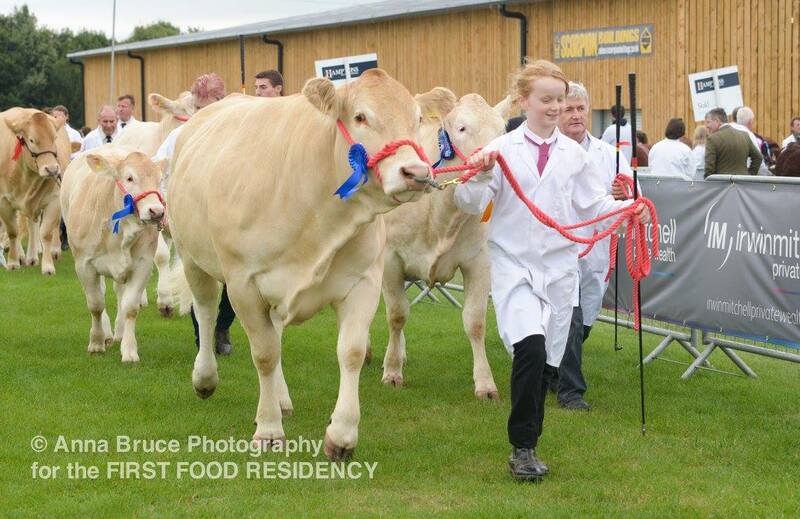 These subjects will be linked to extraordinary collections including an articulated model calf used in veterinary training, 19th-century livestock portraits that reveal the power of selective breeding and a type of straw mattress used in delivery of country babies. As a museum, we are already known for our compelling social history exhibits and for innovative explorations of how our ideas about the countryside have been shaped through popular culture. The combination of new posts, new displays and new programming made possible by this funding will help us to tell a more inclusive, evocative and complete story. It will mean that we are able to speak and appeal to a much greater diversity of visitors and that we can explore complex scientific questions and issues that are of profound importance to all our lives. The Museum’s dedicated team are hard at work developing content for displays and interleaving this with new bio-medical and scientific narratives. A wide range of specialists from the University and beyond will contribute towards this project as it develops, helping to bring our rural heritage alive in new ways and connecting it to cutting-edge scientific thinking. 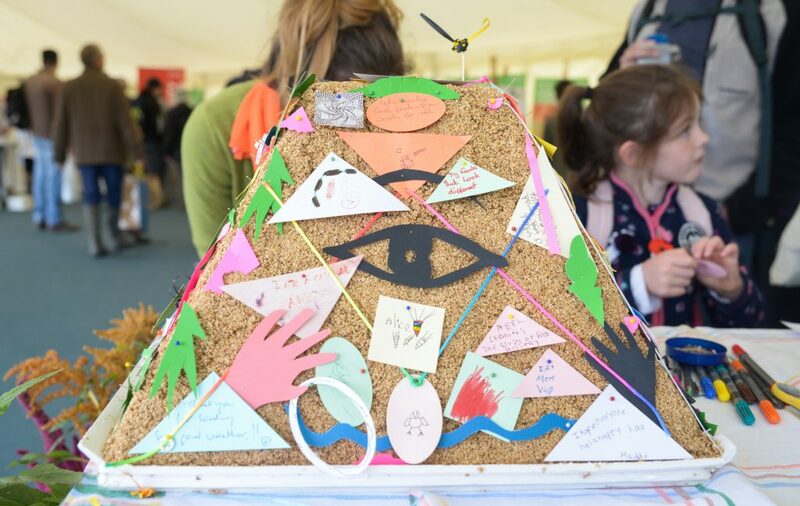 Although rooted in museum-based activity and public engagement, this innovative scheme shows the potential for interdisciplinary thinking and cross-departmental collaboration to deliver exciting new departures and developments. The Museum is also keen for the project to provide students with opportunities to gain experience of public engagement and for related programming to support widening participation in the University.